Bujutsu: old warrior arts devised by professional warriors (samurai and ninja) for use on the battlefield, i.e. jujutsu, kenjutsu, soujutsu, etc. Budo: modern martial arts (created since the Meiji period) that are watered-down versions of older warrior arts devised for practice by commoners for basic self-defense or sport, i.e. judo (from the older jujutsu), kendo (from the older kenjutsu), aikido (from the older aikijujutsu), karatedo (from older Chinese arts), etc. The advantage of the Budo martial arts is that they are much simpler and easier to learn, making them good for the person who wants just some basic self-defense skills but doesn’t have the desire to master the warrior’s way. The Budo usually have one specific emphasis : karate is primarily striking, judo is primarily throwing, aikido is primarily gentle grappling, etc., and many Budo have a strong sport aspect. 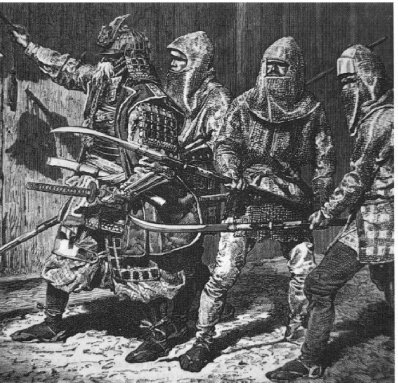 The advantage of the Bujutsu warrior arts is that they are more comprehensive, containing many techniques in all categories: striking, throwing, grappling, pressure point manipulation, restraints, etc., and include a vast array of weaponry skills including staffs, knives, swords, spears, halberds, guns, etc. The Bujutsu have no sport aspect (under the theory that sports create bad habits by limiting participants to “safe” movements), and are more difficult to learn because they usually include a greater volume of information, but the higher level of skill developed as an end result and the emphasis of the spiritual/philosophical aspects are the goals of Bujutsu practitioners. These warrior traditions are under the direction of the Soke (soke) , Dr. Masaaki Hatsumi who lives in Noda city Japan. Dr. Hatsumi is internationally famous as the legitimate grandmaster of ninja martial arts, which had been long thought to be extinct. The Bujinkan Kocho Dojo is under the direction of Wairuda Shidoshi, a licensed instructor and student of Dr. Hatsumi and other shihan (master instructors) in Japan. Wairuda Shidoshi has 27 years of experience in the Bujinkan warriors arts. Each individual has slightly different reasons for training in the Bujinkan dojo, but a general goal might be as follows: Through enduring the hardships of warrior training and developing real skills in handling life-and-death situations, practitioners develop self-confidence and erode self-doubt, anxiety, and fear, which strengthens the spirit and empowers the mind to succeed in any of life’s goals, permitting the attainment and unguarded expression of genuine joy. Combat training becomes the vehicle through which students learn to develop the qualities that many philosophies and religions advocate but which lack a realistic method for developing.